An exclusive excerpt from Walter K Andersen and Shridhar D Damle's RSS: A View to the Inside. The mission statement on the Rashtriya Swayamsevak Sangh Web site refers to the unity of Hindus as the organisation's guiding principle, though there is no formal RSS definition of what Hindutva is. It states that the goal of the RSS is 'reorganising the Hindu society on the lines of its unique national genius' and that the 'ideal of the Sangh is to carry the nation to the pinnacle of glory through organising the entire society and ensuring the protection of Hindu Dharma'. Analysing what the RSS members mean by Hindu-ness (or Hindutva), however, is complicated by the fact that the term has meant different things to different individuals and groups in the parivar. Perhaps this is to be expected of a religious tradition with no unifying structure and no universally accepted set of religious texts. This meaning has also altered over time in response to social, economic and political changes. In lieu of a paramount ecumenical or cultural authority in organized Hinduism, the government has played a major role in both defining Hindu identity and reforming Hindu personal law. That said, the RSS leadership has never referred to Hinduism in the narrow religious sense. (Former communication incharge and now a sah sarkaryavah, or joint general secretary, of the RSS) Manmohan Vaidya said in an e-mail interview that India is a civilisational nation State. He noted that all inhabitants of the land share a common value system about individual and collective life. It has never talked of making Hinduism a State religion, as that would be complicated both by the accepted narrative of India as a secular state and by the deep sectarian and philosophic divisions among those who identify as religiously Hindu. RSS literature, in fact, speaks approvingly of the religious and cultural diversity of Hinduism. Hindu religious iconography was virtually absent within the RSS until the Ram Janmabhoomi movement of the late 1980s. After that movement lost much of its emotional attraction in the late 1990s, the RSS and most of its affiliates, with the prominent exception of the Vishwa Hindu Parishad, have only rarely used Hindu religious symbolism in their programmes. At least at the leadership level, the RSS has never shown favouritism to any particular sect of Hinduism (probably a necessity given the diverse forms of Hindu worship). As Vaidya noted in the e-mail interview, the RSS recognises that there are multiple paths to the divine, all of which are equally valid, a more inclusive definition of Hindutva that seeks to accommodate the non-indigenous faiths. More recently, probably to escape the negative connotation associated with the term Hindutva, the RSS chief (Mohan Bhagwat) has used 'Hindu-ness' to signal inclusiveness when he asserted that it is free of the dogmas associated with Hindu religion. The changes in the social composition of the RSS, especially with the entry of members of upwardly mobile social groups, and the imperatives of its political affiliate have prompted the RSS to be more inclusive. Notice that the RSS mission statement mentioned above also refers to the organisation of 'the entire society' and not just of those who consider themselves religiously Hindu. Perhaps the most relevant term to use for this study is Hindutva (or perhaps Hindu nationalism), as it focuses on how the RSS aims to operationalize its ideology in such fields as social welfare, labour, education, politics and so on. The RSS itself moved away from the exclusionary view in the 1970s by accepting Muslims and Christians. Regarding the territorial and cultural aspects of Hinduism, (Vinayak Damodar) Savarkar always placed more emphasis on the cultural side. This emphasis has also been the RSS's position from the time of (its founder Keshav Baliram) Hedgewar. Hedgewar, who very much admired Savarkar, viewed Hindus as 'the people of the land'; anyone else living in India did so at the sufferance of the Hindu majority and consequently should be expected to adopt Hindu culture. Savarkar never abandoned his scepticism of whether Muslims or Christians could ever become culturally Hindu. (Madhav Sadashiv) Golwalkar, Hedgewar's successor, subscribed to this scepticism as well. His description of the so-called Christian threat is less harsh, though he says that Christian activities are primarily concerned with conversion, with the end result being that the Hindu convert's 'hereditary religion, philosophy, culture and way of life should become absorbed in a world federation of Christianity'. (Madhukar Dattatraya) Deoras, Golwalkar's successor, launched a more activist phase of the RSS in the late 1970s by publicly attacking caste hierarchies. While some RSS members have reservations about a casteless society, most of the senior RSS officials we met (primarily Brahmins) view social and civic equality as a legitimate goal for Indian society, and thus, a goal for the RSS as well. As the various affiliates of the RSS, especially the political members of the parivar, began to operate in their respective fields, it soon became obvious to some of their leaders that there was an advantage in keeping the door open to Muslims (comprising over a tenth of the population) and others who did not identify themselves as Hindu religiously. More recently, the RSS and its service affiliates have organised several activities in a bid to reach out to the Christian communities in the north east. The narrow view of what constituted a 'Hindu' became less and less viable, and even the RSS opened itself up to non-Hindu (mostly Muslim) participation in shakhas in 1979. Its core national leadership gradually began to refer to all people in India as part of a broad Hindu culture that accommodated the country's significant diversity. The RSS even formed a group in 2002, the Muslim Rashtriya Manch, to work among Muslims. While this group and its agenda of cultural assimilation are unlikely to gain substantial Muslim backing, the very fact that the RSS and its affiliates are mobilising Muslims indicates a shift from the older perception that Muslims could not join the Hindu nation. By portraying economic development as at least equal in importance to these usual Hindutva issues, ... Prime Minister (Narendra Damodardas Modi) seems to be making development a key element that shapes his views regarding Hindu nationalism, a principle that is far less controversial and far more inclusive than the traditional Hindutva platform. Adding support to this notion was Bhagwat's statement in a speech to entrepreneurs that business -- and by extension prosperity -- should be thought of as part of one's dharma. The dilemma remains, however, that many activists in the Sangh Parivar -- especially within the Vishwa Hindu Parishad -- look at Hindutva in traditional terms and now feel empowered to speak out about it, often in ways that embarrass the prime minister and his government. 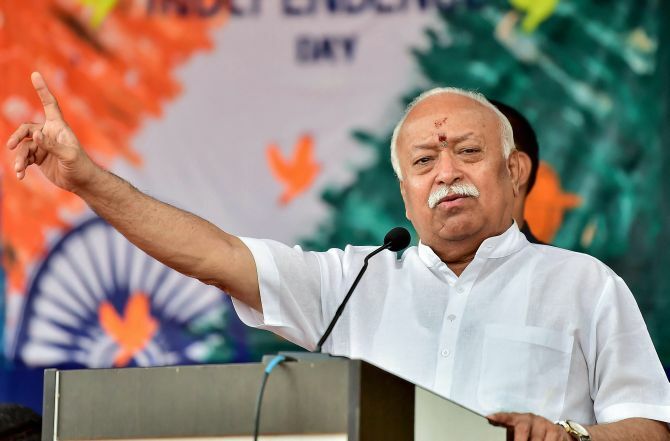 Bhagwat, aware of the advantages of keeping the Bharatiya Janata Party in power, is wary about the RSS taking steps that would undermine the popular standing of either the prime minister or the party. The internal ideological stirring within the Sangh Parivar can be witnessed in the questioning by senior figures of long-held conservative social views in early 2016. Manmohan Vaidya reportedly said that the RSS does not dictate food habits and that RSS members in the north east eat beef. At least part of the caution regarding what appears to be a more liberal stand may be a sort of testing of the waters to see how RSS members and the larger society responds. We also believe that this cautious liberalisation is possibly due to the much greater social diversity of the RSS Sangh Parivar, whose active membership includes a significant part of the newly emerging urban middle class. We cannot imagine that senior figures of the Parivar would have openly expressed such unconventional views even in the recent past. The essential element of Hindutva seems to be a relatively straightforward patriotism, something bordering on an adoration of the motherland/fatherland and visually represented by the iconography of Bharat Mata. But most members of the RSS, or the BJP or the other affiliates, very likely do not think in these ideological terms and, when they use them, they lack the coherence and consistency of the ideologues and senior leaders. Mass support often responds to non-ideological cues that people believe are important in their lives, such as social stability and economic development and maybe even 'Hinduism in danger' or 'illegal migration from Bangladesh'. The rapid growth of the RSS and other affiliates since the early 1990s probably is due to their appeal to a similar yearning for social stability in a time of rapid change. Excerpted from RSS: A View to the Inside by Walter K Andersen and Shridhar D Damle, with the kind permission of the publishers, Penguin Random House India. What role will the RSS play in the 2019 poll?